shoe shopping is total excruciation. it boggles me till now to no end how on earth females can shoe shop and innocuously try and try and try pair after pair, ridiculously parking in the shoe store for a good hour or so, and more probably, then zap up an exorbitantly fat bill with the supposed final selection of box hill, no, mountain, of shoes. seriously, all of that, when humans are only born, to my knowledge of clinical anatomy, with only one pair of feet?!? unfortunately, there was not really much of a choice, given that the need arose for such an onerous deed to be done, or else it would probably take godzilla, or maybe king kong, or the incentive of a billion dollars, to boot kick me out of the house. if feet could talk at this point, mine would be crying bloody murder and yelling at me like a shrieking banshee. my feet ain't calling the calvary in, so reckon they have either decided to play the rebel, or throw in the towel and wave the white flag in defeat, or have completely died and ascended to foot heaven, or heel and toe hell from all the distress they have been painfully subjected to. now know why heels in this modern age and time are famed silent barbaric assassins, where they are commonly, and affectionately to some, nicknamed as "killer heels". 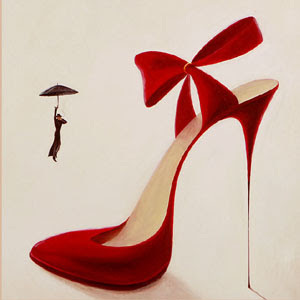 it is not without reason, because heels, all five inches of it, murder one's feet, literally. and no, the devil ain't wearing prada. And Sarah Jessica Parker would have us believed that shoes are a girl's best friend. well... that probably would and might apply to most... but then again... there're always exceptions to the rule... no?? ?